This won’t be as long as some of our youth football help Monday articles but we wanted to follow up on last Monday’s article about the Spread offense, how it is being used in youth football and more importantly how you can put a stop to it as a defensive coach. Basically if you read last week’s article titled Stop The Youth Football Spread Offense you know that our premise is that the only reason any football coach would allow his defense to get spread all the way across the football field is if the Quarterback can make that necessary. We think that a lot of youth football coaches (and maybe some high school coaches) are defending things that are not going to happen or at least not happen enough to get you beat. Our thought is that if you call the youth football spread offense coach’s bluff he is going to be forced to do one of two things. He can either choose to “play left handed”, meaning he must trust his young QB to try to beat you with his arm on the outside or secondly the coach will be forced to bring his wide receivers back inside and play a bit more traditional youth football scheme out of more traditional formations. So we have taken our five base defenses in the FirstDown PlayBook youth defense section and designed a “Spread Beater” front for each one. Currently there is just a 2×2 spread formation in each base defensive section but we will draw up a 3×1 also very soon. Of course, we would like for you to sign up with FirstDown PlayBook to get all of this and 30,000 other football plays but we thought it wouldn’t hurt to give you this one version of our 4-4 Spread Beater vs a 2×2 formation for free today. 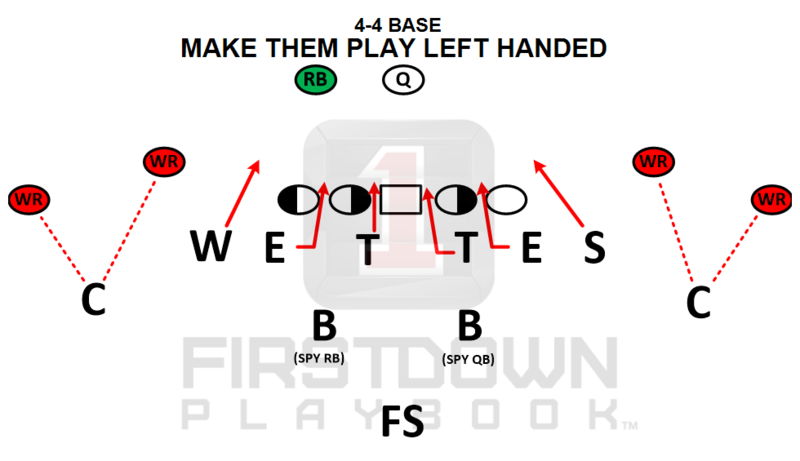 To see the detailed coaching points that go with this defense tap on the drawing below!